itMate offers WiFi internet solutions for your home or business to people in Bergen County and surrounding areas. itMate has a custom solution for your budget. WIFI is an acronym which stands for Wireless Fidelity wireless internet. The term Wi-Fi is often used interchangeably with wireless Internet. In a simple context, we may describe that the wireless Internet connection allows the access of an individual to the Internet connectivity via radio waves. There’s no more need of any hard-wired cables to connect with your devices such as personal computers, laptop, smartphone or similar mobile device. 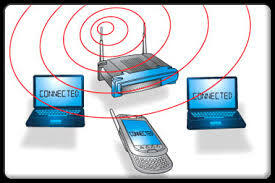 Wireless Internet can be accessed directly through your preferred internet providers. Using wireless internet has many advantages: first, several devices can get access or share on a single Internet connection; second, users can access of the Internet in a non-stationary mode which means, you can stay at any point within range of the signal; third, because of the connectivity of the wireless Internet, it helps decreasing operational costs in the business area. What good about wireless internet connections are not limited in your office buildings or your home or neighbors but also in selected public locations like coffee shops, schools, airport terminals. Laptop or smart phone users can enjoy their connections via Hot spots (the access point from where the wireless signal is broadcast). Different access may give you different rates of speed depending on how many users are get connected with it. The fastest connections as of the current updates are 802.11a and 802.11g, which provides connections with a maximum speed of 54mbps. Wifi users are enjoying the benefits of the following: first, the convenience of handling devices with less hard-wired concern, second, the mobility where instant connectivity is possible anytime anywhere; third, the productivity of users are enhanced due to availability of information in methods; fourth consumption, instead of adding more wired connections to multiple computers or devices, it gives a little of what is needed therefore, also incurred cost efficient techniques; Fifth, expansion, where Wireless system can serve an increasing quantity of patrons with the existing tools.